Manchester United Transfer Speculation: William Carvalho and/or James Rodriguez? Manchester United transfer speculation on who will join the squad next season under LvG is still running. In a tweet by Man Utd Future (if I was not mistaken) Sporting midfielder William Carvalho transfer to United is about to complete. The club management was sent to Portugal to set legal papers and then announce the deal. One setback to United is the president of Sporting is reluctant to let this player go. Manchester United transfer speculation is not only on Sporting defender but also to Colombian attacking midfield James Rodriguez. William Carvalho is a defensive midfielder from Sporting Lisbon and he could play as central midfield too. He was called to join Portugal national team by Paulo Bento and he only had two games in World Cup 2014. He do not involved in Portugal first game, but his presence in Portugal line ups next two games bring the team draw with USA and a win against Ghana. If the player join the club it would pleas Luis Nani and I hope could make him settle in United and fix his performance. In the last two seasons personally I feel disappoint with his game and wishing either Sir Alex or David Moyes sells him. Manchester United transfer speculation said Liverpool also have interest to this player. 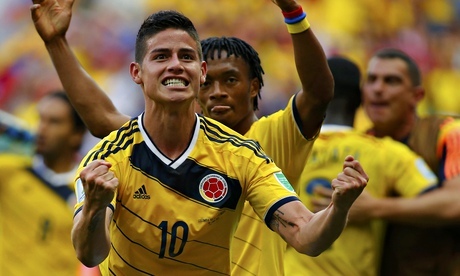 James Rodiguez is Antonio Valencia colleague in Columbia national team. They played together in World Cup 2014 matches and James Rodriguez is a headline all around the world with his goal when Columbia defeat Uruguay 2 goals to nothing. United could have this player for 5million pound from Marseille, but the chance is little. Mirror.co.uk reported that this player wanted to play in Spain instead of English Premier League.